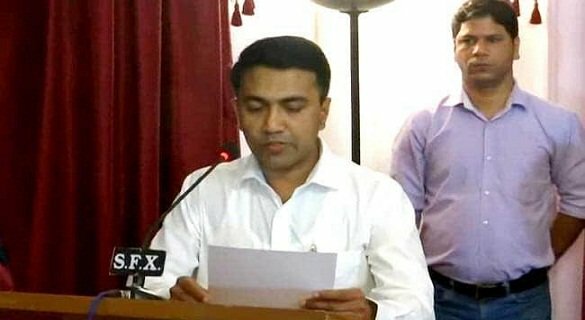 Panaji: Goa Legislative Assembly Speaker Dr Pramod Sawant was sworn-in as Chief Minister of Goa post midnight on Monday. The oath of office and secrecy was administered by Goa Governor Mridula Sinha at Raj Bhavan at Dona Paula, near the city. He took oath in Konkani.The swearing-in ceremony was attended by Union Minister Nitin Gadkari, cabinet colleagues of Dr Sawant, MLAs, among others, were present on the occasion. Besides Dr Sawant, MLAs Sudin Dhavlikar, Vijai Sardesai, Babu Azgaonkar, Rohan Khaunte, Govind Gaude, Vinod Palyekar, Jayesh Salgaonkar, Mauvin Godinho, Vishwajit Rane, Milind Naik and Nilesh Cabral were sworn in as cabinet ministers. Though distribution of portfolios have not been announced but it is likely that Mr Dhavalikar and Vijay Sardesai would be appointed Deputy Chief Ministers.The swearing-in took place but not before full day marathon series of meetings and discussions by national Bharatiya Janata Party (BJP) leaders with alliance partners- Maharashtrawadi Gomantak Party (MGP) and Goa Forward Party (GFP)-who were firm on their demands. According to a message flashed by Department of Information and Publicity, the swearing in ceremony was to take place at 2300 hrs but it got delayed and ultimately took place at around 0200 hrs. Though Bharatiya Janata Party (BJP) National President Amit Shah was in the city in the evening but it was Union Minister Nitin Gadkari who along with BJP National Secretary B L Santosh held series of meetings after arriving in the state on March 17 and succeeded in securing support of MGP and GFP. Both MGP and GFP have three MLAs each and their support is crucial for survival of the government as BJP as only 12 MLAs in the 36 member House.